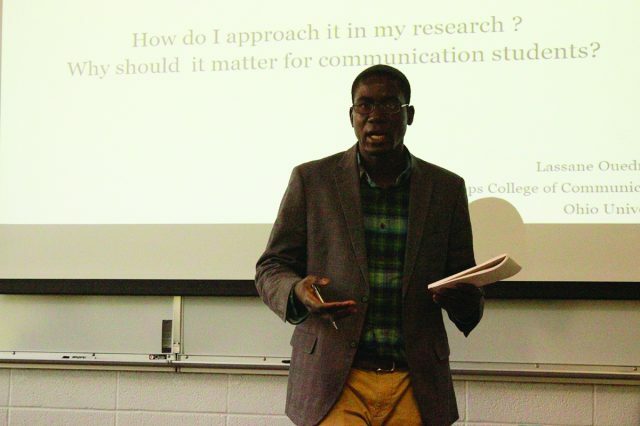 This was the question posed to Pat Lehman’s Principles of Public Relations class last week when Lassane Queodraogo, a 2014 graduate of Goshen College, returned to campus to speak. Queodraogo is currently a Ph.D. student in Media Studies at Ohio University in Athens. He came to share and connect his work with media and the Muslim world to the class’s current chapter on cross-cultural communication. In the case of cross-cultural communication, the goal is to create common ground without falling into two “sins”: essentialism or exceptionalism. Essentialism, he explained, is a belief system grounded in a conception of humans as “bearers of a culture” which differentiates them from others. Being aware of this prevents communicators from assuming that they already know everything about a culture and the people in it. Exceptionalism is defining another person by the distinct qualities that create differences. He explained that by seeing the culture as “others,” a person doesn’t find any similarities with it, and this is just as harmful as assuming you already know everything about the people in the culture. Queodraogo must maintain an awareness of both things as he does his work. He does this research and teaches the class Media in the Muslim world at an undergraduate level. The Muslim world, he pointed out, is much more than just the Middle East. The region he focused on was western Africa, specifically Mali, Niger and his home country Burkina Faso. This immediate connection gives Queodraogo another principle to keep in mind: positionality. Queodraogo explained the bias he has when he does research – he is a Muslim who attended a Christian college and uses Western research tools. By being aware of this and situating himself in his research with that knowledge, he is able to do research without imposing himself onto the people he is researching; he knows that difference should not raise a red flag. The class was able to apply lessons, including the importance of avoiding ethnocentrism, taking the opportunity to travel to experience culture first-hand and doing good research before diving into a new culture, to the field of Public Relations and to other life experiences such as SST.